Eduardo A Bonin, MD MSc, Erica Moran, MD, Mary Knipschield, McConico Andrea, Juliane Bingener, MD, Christopher Gostout, MD. Developmental Endoscopy Unit, Mayo Clinic, Rochester, MN, EUA. Background: Human NOTES™ abdominal exploration is technically feasible by using both transgastric and transvaginal approaches. NOTES may offer an opportunity for targeted treatment of isolated liver metastases. The flexible endoscopy platform imposes significant constraints regarding organ and operative field exposure. Patients and methods: With IRB exemption, two fresh frozen female human cadavers were used. NOTES entry was accomplished by needle knife, balloon dilation, or scissors (transvaginal). A single port laparoscopy system inserted at the umbilical scar was used for surveillance. The endoscopes employed were a gastroscope (GIF-H180-1, Olympus, Tokyo, Japan), a colonoscope (CF-H180AL-1, Olympus, Tokyo, Japan) and a prototype R-Scope (XGIF-2TQ160R, Olympus, Tokyo, Japan). A list of structures and abdominal organs seen by the flexible endoscope and physically contacted by biopsy forceps were recorded (RUQ, LUQ, mid-abdomen, LLQ with pelvis, RLQ with pelvis). Liver segments were identified, along with control of access. Results: Liver access and contact was successful with all 3 endoscopes; TV: Anterior surface of the right lobe, liver edge & gallbladder fundus; TG: 2/3 anterior surface of right and left lobes & gallbladder fundus. R-scope was most ideal per access site because of its intermediate length (130cm), stiffness and dual channels. Colonoscope looping with unstable distal tip occurred during TV entry. 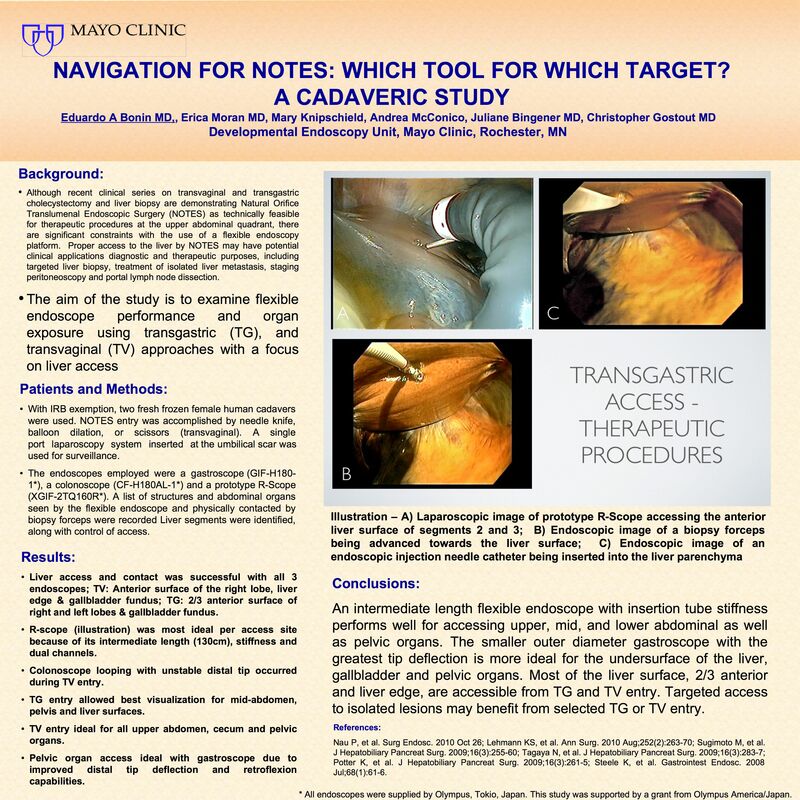 TG entry allowed best visualization for mid-abdomen, pelvis and liver surfaces. TV entry ideal for all upper abdomen, cecum and pelvic organs. Pelvic organ access ideal with gastroscope due to improved distal tip deflection and retroflexion capabilities. Conclusions: An intermediate length flexible endoscope with insertion tube stiffness performs well for accessing upper, mid, and lower abdominal as well as pelvic organs. The smaller outer diameter gastroscope with the greatest tip deflection is more ideal for the undersurface of the liver, gallbladder and pelvic organs. Most of the liver surface, 2/3 anterior and liver edge, are accessible from TG and TV entry. Targeted access to isolated lesions may benefit from selected TG or TV entry.